When people think of bees, they imagine warm, sunny days and lots of blooms, but the dead of winter is the best time to get your equipment ready so you won’t be caught short when the bloom comes roaring in at the beginning of spring. Bees, like any other livestock, have specific needs and it’s our responsibility to make sure that we provide good animal husbandry for them. Now is the time to start taking stock of your equipment. As commercial beekeepers, we use Langstroth hives , but most of the advice here will apply for any kind of hive. There are two types of wax moths that live in the United States: the Lesser Wax Moth  and the Greater Wax Moth . Supers  stored over winter with honey-extracted comb are a bonanza for wax moths. They especially like dark, warm, and poorly ventilated areas (outbuildings, barns, garages) or unprotected supers that get wet from being stacked and stored outside. The larvae of the wax moth will chew through empty comb in their search for food (mostly pollen, but they’ll eat whatever is handy) and can cause significant damage. Maximum light and ventilation are the best defense against infestation. For hobbyists and small scale commercial beekeepers, store supers of extracted-comb or individual frames of extracted-comb by suspending them on wires strung along the rafter of a garage or well ventilated, well-lit outbuilding. It’s important to check your stored supers periodically to make sure wax moths aren’t destroying your frames. If caught early before too much damage is done to the comb, use a hive tool  to dig the larvae out. Another option is Paramoth  wax. If you discover that there is too much damage to the frame, it’s important take off the entire comb, inspect to make sure the wire is still good, and replace with a new sheet of foundation. If the wire is bad, rewire the frame, and add new foundation. Note: this work should be done away from the area where your frames were stored to avoid reinfesting your repaired frames. If you have chickens, gather up all the infested beeswax and give it to your chickens. They’ll love scratching through the beeswax bits in search of tasty, high protein larvae treats! Thoroughly clean the storage shed, too, before returning your cleaned frames and supers to make sure they don’t get reinfested. Bug bombs are the quickest and easiest way (be sure to follow manufacturers recommendations), but if you’d like to go a more natural route once you’ve cleaned the storage room, you can cut cedar boards and soak them in cedar oil  to drive the moths away. Wait 24 hours before returning your supers for storage. It’s also time to take stock of the equipment you have on hand to be ready for the honey flow. Inspect your extra supers and boxes for damage- repair cracks, check for dry rot, and apply a fresh coat of paint. Take an inventory of how many frames you have and build new ones to replace damaged frames and to insure you have enough extras to put into supers when everything is in full bloom and the nectar flow is high. Get your nucs  ready if you plan on splitting hives or catching swarms. If you do plan on splitting hives or catching swarms, build your new hive stands now. Hive stands help prevent ant infestations and help keep skunks from eating all your bees. Use coffee containers (or something similar) filled with a little water under each stand leg to make “ant moats” to keep the ants from climbing up the legs. I, (insert name of landowner here), have requested that (insert your name or the name of your apiary/farm here) place hives on my property, located at (insert full address of bee yard here). All beehives on said property belong to (insert your name or your apiary/farm name here). By signing this contract, (insert your name or apiary/farm name here) or employees have the right to unrestricted access to the beehives belonging to (insert your name or apiary/farm name here). All products of the beehives, located in the beehives, or removed from the beehives are the sole property of (insert your name or apiary/farm name here). (insert your name or apiary/farm name here) is providing free pollination services in exchange for the use of the property as a base apiary. By having the minimum of (insert minimum number of hives here) present at all times during the growing season and a maximum of (insert max number of hives here), (insert your name or apiary/farm name here) has fulfilled their end of this agreement. I agree that (insert your name or apiary/farm name here) has no control over what crops/plants/flowers the bees decide to gather pollen and/pr nectar from. I agree that (insert your name or apiary/farm name here) has the right to cancel this contract and move the hives at any time that they deem the property to be unacceptable for the placement of beehives. I agree that if I cancel this contract, (insert your name or apiary/farm name here) will have a minimum of 60 days to move the hives off of my property, and that all conditions of this contract are in effect until the hives are moved. I agree not to move, disturb, or harass the bees or their hives. I agree not to give anyone other than (insert your name or apiary/farm name here) or their employees access to the hives. I agree that I am the owner of said property and have the right to allow (insert your name or apiary/farm name here) to set hives on said property. 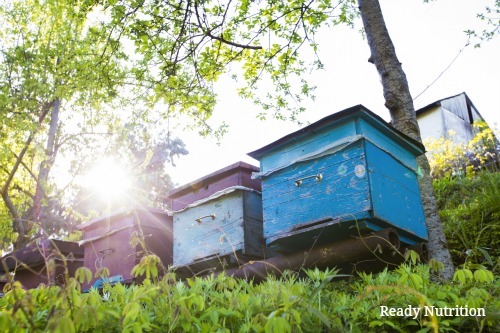 By doing some winter maintenance on your apiary equipment, building new equipment, and securing bee yards for the coming season, you can be better prepared for spring flows. Up next, we’ll talk “spring checks”- what you need to do now for your active hives to make sure they are at their peak health for the coming season. Stay tuned!